This chapter will concentrate on insights from Husserl’s extensive research manuscripts on the topic of the “life-world” primarily from the 1920s and early 1930s that were recently published in Husserliana, Volume XXXIX. One striking feature of these studies is the emphasis on what Husserl calls “realities,” concrete individual objects that exist in space and time. This suggests that his ontology is actually closer to Aristotle’s than it is to Plato’s. Another prominent theme is the essential role of embodiment and in particular certain features of embodiment such as affectivity and serving as a zero-point for orientation that are at the bottom of any life-worldly experience of the various kinds of objects that are encountered in this world. 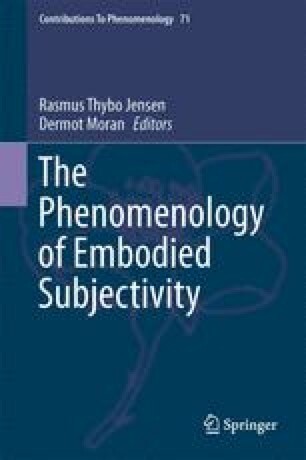 This essay traces out some of those features as a kind of “transcendental deduction” of embodiment from Husserl’s perspective, showing how this establishes a necessary relativity of all life-worldly experience and yet how Husserl accommodates these embodied relativities not just as hurdles to be overcome on the way to intersubjective understanding and to genuine scientific knowledge, but rather as the fundamental building-blocks of all intersubjective understanding and knowledge, including scientific knowledge, and sociality in general.